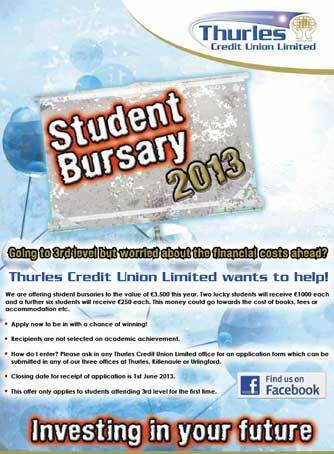 Thurles Credit Union has announced the launch of its Annual Student Bursary Scheme, and to this end are inviting applications from all eligible Leaving Certificate students to apply for these significant financial bursaries on offer. Credit Union President, D. J. Darcy, said that “The Credit Union was very pleased to sponsor the Student Bursary once again,” and referred to the excellent response among all the secondary schools in the area to the scheme in 2012. Speaking at the 2013 Launch, Mr. Darcy said “The costs of third-level education have risen considerably in the past few years and we feel that this is an excellent way of easing the burden on hard-pressed parents in these difficult times.” He urged all those students with ambitions to go to Third-Level College in the next academic year, to immediately submit an application. Marketing Officer, Michael Harty, stated “Thurles Credit Union’s bursary is different from most other similar schemes in that is not based on academic achievements but solely on ‘the luck of the draw,’ for all the eligible students.” He stated they are offering bursaries with a total value of €3,500 to applicants from within their Common Bond. The Bursary Scheme is open to all eligible Leaving Certificate Students who intend pursuing a full-time third level course for the first time this year. Applicants must have a Thurles postal address and either the student, or a parent or guardian, must be a member of Thurles Credit Union. Leaving Certificate Students, who are not members at present, can join Thurles Credit Union and enter the bursary competition. The closing date for entries is June 1st 2013. The Bursaries will be drawn by lottery from amongst all the qualifying entries, under the supervision of a Peace Commissioner. Entry forms are currently being distributed to all the secondary schools in the area, and students from Thurles attending schools outside the area can apply to the Credit Union offices in Thurles, Urlingford or Killenaule. More Information: Visit Website, Facebook, Twitter Account, or simply Telephone 0504 91700.